Norwegian energy giant Equinor, formerly the state-owned company Statoil, has made a proposal to the Greek government to create a floating wind farm, according to greekreporter.com. The project would be located in the center of the Aegean Sea and would be capable of serving up to 40,000 households. According to the Athens News Agency, the investment plan has been already discussed between the Norwegian ambassador to Greece and the Greek government. The Norwegian firm believes that a wind turbine platform will be an ideal investment for the region due to the relatively low waves there. However, there are strong winds prevailing over the sea in the area between Tinos, Syros and Mykonos Islands. The Norwegian Embassy in Athens, which has taken initiatives in this direction, is co-organizing a seminar in April with ELETAEN, the Greek Wind Energy Association. 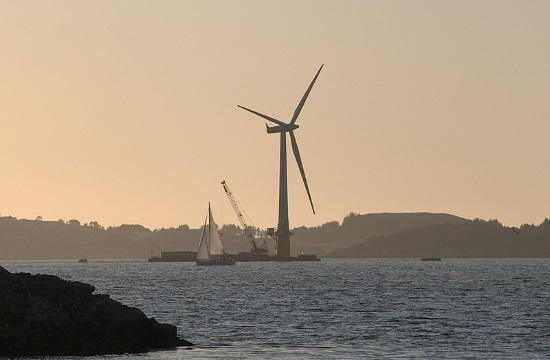 The forum will discuss floating wind turbines, which are offshore systems mounted on floating structures to generate electricity in water depths where fixed-foundation turbines are not feasible. During the seminar, the Norwegian Embassy will seek to highlight Norway’s experience in this domain and bring renewable energy companies in Greece into contact with Norwegian experts. Officials from the Greek government and the energy sector are also expected to participate.